Each era has its own business hoax. The schemes develop in good times and bad and adapt to the special conditions of each era. With the benefit of experience and hindsight, the hoaxes appear obviously as frauds, but in the context of their period, they are seen as believable and beguiling. They inspire hope and excitement and they attract millions of followers. A common thread of many of these hoaxes is the pyramid scheme. The insidious, underlying flaw in the pyramid scheme is its denial of the future. Its allurement is the promise of immediate enrichment. It most destructive impact is not financial but communal. 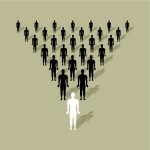 Pyramid schemes enroll large numbers of people in a plan to defraud larger numbers of others. Here’s how a typical penny stock scheme works, although there are many variations on this theme. A stock brokerage company makes a deal with a small group of investors to sell stock in a newly formed public company and then to merge this new company with an existing privately held one. The new public company will have no product, no history, no experience, nothing. Shares will be sold to the public on the story that this is a `blind pool.’ or `shell,’ that is, the new public company will have the structure of a publicly traded company which allows investors to buy and sell shares and better enables the company to gain new capital. It will also have cash available from the initial shares its sells. When the initial stock is sold, it will have a public structure and a large bank account without debt, nothing more. Then, it will merge with the private company which is engaged in some enterprise or another and thereby fold the private company into the public structure. This process is a cheaper and easier way for the private firm to become publicly traded without the federal or state regulators, journalists or shareholders ever examining it. The shell will be sold boldly as just a new company with a bank account but one that has great `potential.’ Shareholders are told that an impending and portentous merger will send the stock skyward. The penny stock investor is really buying a `future.’ The shell by itself is an unattractive business proposition indeed. But its potential is great due to possible subsequent events. This impeding event in the penny stock scheme is the much heralded `merger’ leading to subsequent resell of the stock at a big profit. Now comes the mathematical trick common to all pyramid schemes. In penny stocks, the math is spelled out in the prospectus sent to each shareholder but is usually ignored or not understood by the investors. Penny stocks operate best in a booming economy where anything seems possible. People are investing in hope, so, why bother to pore over the complicated language of the prospectus? Millions of shares are issued but only 20% are actually sold to the public. One or more people control the other 80% even though they may have invested little or no money of their own. This ensures massive profits to the insiders, including the company waiting in the wings for the merger, and to prevent any interference from those who actually put up the money. The stock is sold for about one penny or a few pennies a share. Investors believe this is very cheap and they are getting a bargain. It is a low initial investment. Brokers hint that the stock could go to a dollar! They are getting in on the ground floor. This shell will soon merge with a company that has explosive potential for growth. This is an opportunity of a lifetime! If the total number of outstanding shares are divided into the total dollars in the shell’s new bank account, the true value of a share of stock is revealed to be perhaps 1/20th of one penny. Far from a bargain, at one penny a share the shareholders actually bought stock that is grossly overpriced. Further, the insiders who own 80% of the shares have become instantly wealthy with the initial sale of shares. If $5,000,000 of stock are sold to 5000 shareholders, each buying about $1,000 of stock, then the day after the offering, the insiders gain $4,000,000 (80% of the net worth of the company). Like the MLM recruit who enters the system years after the MLM company was founded and faces extraordinary odds against success, the penny stock investors are effectively beaten even before the company got off the ground. Or are they? Like the MLMer who has a losing business unless he is able to recruit many others below him and earn overrides from their losing investments, the penny-stocker can redeem his position handsomely if he can unload the stock at a profit to another investor behind him, the “bigger fool theory” as it is called in stock broker circles. Meanwhile those at the top of both types of schemes, the brokerage company and insiders in the penny stock deal, the founders and first top-line distributors in the MLM, pull the strings and profit accordingly. As in MLM, some winners are needed to convince many more hopefuls to invest. Evidence must given to entice others, even if the evidence is bogus. In MLM, the lives of the wealthy upliners are presented as proof that the system works and the opportunity for success is available to all. The system functions similarly in penny stocks. The first level of investors is offered the chance to sell its shares at 1 1/2 cents a share, a 50% profit in only one or two weeks! The brokerage company that is `making the market’ buys back the shares, but unknown to the sellers, the brokerage company has already lined up twice as many people to buy these same shares at 2 cents a share. The brokerage company makes as much as 60% commission plus transaction fees on the `spread’ between one and two cents, thus making more profit than the initial shareholders. Additionally, insiders are positioned to buy and resell the stock themselves in the artificially skyrocketing market. The buy/sell transactions are conducted on the same day. The penny stock system works by getting investors to make relatively small investments, usually $500 to $5000. Each level of shareholders that is sold stock, therefore must grow in numbers of people to account for the higher priced shares. If five thousand were needed to buy the shares at one penny a share, with each investing an average of $1,000, then ten thousand more investors are needed to make similar size investments when the stock is at two pennies a share. The base of the pyramid must now continuously expand to keep the entire structure from toppling. The rumored merger is made with the phantom company. Newsletters and phones calls pour forth from the brokerage company to trumpet the good news. The merger of the shell with a private company provides the penny stock scheme with a certain validity. An empty shell was taken public; people invested; shares are bought and sold on the basis of this future transaction. But, in reality, the merger itself was as worthless to shareholders as the original shell. Its only purpose was to excite investors. The real money is to be made in the buying and reselling of the stock, not in any tangible business activity of the merged company itself. As more penny stock investors are solicited, the stock keeps rising. Soon the stock goes to five and then seven and perhaps eventually to twelve! For those on the inside, this is a veritable gold mine. For some shareholders who invested early, the program appears to be a wonderful and fully legitimate investment. Who can argue with making money by buying and selling stock? It’s as American as apple pie. It’s legal. It’s just supply and demand. This is capitalism at its finest. What a system! The brokerage house has been earning huge commission rates on trades with stock rising at 50, 100 and 200% increments. The inside investors associated with the brokerage firm have been reaping massive profits. But the bonanza does go not forever. The stock is astronomically overpriced relative to the assets of the company. Further, the number of investors needed to keep the stock propped up is becoming impossible to recruit. Some shareholders are beginning to ask questions about the actual business of this merged company. A point is reached at which the stock cannot be resold at a higher price. The collapse begins. Those holding the stock at this point suffer major losses on their investments. The real value of the stock is now revealed to be what is what it was all along, a small fraction of a penny or perhaps nothing at all. The penny stock brokerage firm, it should be remembered, is not in any way harmed when the stock collapses. Only the most recent investors lose. The firm can move forward to create yet another similar scheme. It could also repurchase the shares from the losers and begin the entire process again with yet another “story” about the firms great potential. Pyramid schemes do not necessarily collapse, but most investors do always lose. The scheme can keep going. The losses or “collapse” are borne by the investors. It should be noted that taking companies public with very low stock prices and even using the merger with a blind pool or shell is not inherently fraudulent. It can be a valid method of helping a new company grow rapidly. Rather, it was the selling of grossly overpriced stocks (even though the selling price was only one penny a share) and then manipulating the price to entice more shareholders into schemes in which most were destined to lose money that constituted the fraud. Likewise, a distribution system that allows distributors to appoint sub-distributors is not inherently fraudulent. It becomes fraud only when the company and the upliners place the majority of their efforts on recruitment of distributors rather than sales of products. Unfortunately, this kind of abuse pervades and characterizes the multi-level marketing industry. The MLM industry operates under the thin protection of a 20-year old ruling by an FTC judge that declared the basic business model legal. However, unlike the penny stock business, MLM does not have a federal or even state agency that specifically oversees its operations. There is no testing or certification for distributors. Companies do not register with any MLM regulatory body or send quarterly reports of sales activities as did the penny stock brokers. Even when an MLM company sells stock to the public, its day-to-day sales and marketing activities are not regulated, only its stock sales. Some analysts have argued that MLM distributorships are, in fact, securities. They are bought on speculation. Their value rests on future transactions of downliners and are promoted this way. Buy in now! Get in on the ground floor! One of your downliners may become a superstar and take you to unimaginable wealth! The MLM industry naturally opposes this regulation. Few people favor greater government regulation of any business. Yet, regulation normally occurs only where abuse has been rampant. Until the MLM business goes back to selling products to consumers rather than making its money by using new distributors as its unwitting customers, the call for regulation will grow.